I thought I had won this signed, first edition paperback some time ago, but after doing a Teaser Tuesday for it, my sister, Laura, and I got to talking. She had two signed copies and had given me one. Thanks so much Laura. Blood Debt is FREE, so grab you copy now. 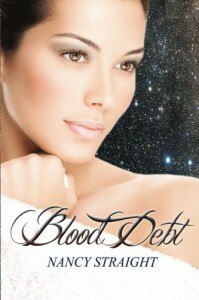 Blood Debt is ,for me, an amazingly refreshing and original paranormal romance novel, heavy on the Greek mythology. I have not read a lot about Centaurs, but I am blown away by how much I ended up loving this story by the time I was done. It kept getting better and better and by the end, I was so involved with the characters, that I was screaming for more. The shifting point of view was confusing at first, but it didn’t take me long to adjust and the story flowed better, unfolding so rapidly in front of me that I forgot about it. Camille had wondered who her father was, but never would have chose to lose her mom to find out. On her death bed, Camille’s mother did tell her who her father was and after some phone conversations and a background check (thank goodness for the internet, lol), she is flying to meet him. 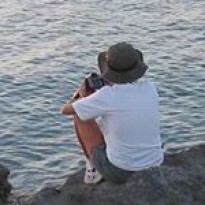 It struck me as odd, that anyone, especially a female, would go so quickly and alone on top of it. But, this is fiction and I am happy to overlook that and cut right to the chase. Camille’s heritage traces back to the first Centaur touched by Zeus, but she is totally unaware of it. She does not know she is a Centaur, let alone know about their traditions and customs. How far will you go for love? Cami is going to show us the way…and I am shocked by what’s happening on the page…..oops, sorry, it’s a secret. You will need to read her story for yourself. I NEVER saw anything like this coming and I am stunned by Nancy Straight’s ability to take the story to such a creative level. It just keeps getting better and better. I guess I need to explain that a bit and you will see what I mean. 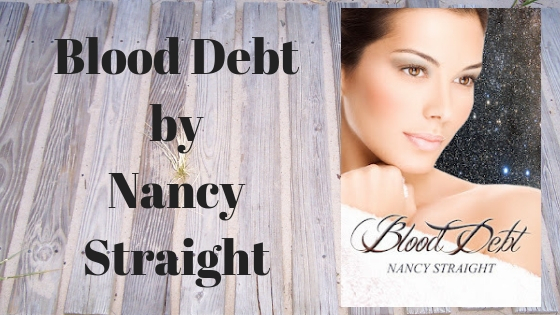 Blood Debt started out as an easy 3 star novel. If it would have stayed that way, I would not have been disappointed. But, it didn’t take long and I knew I had to bump the rating. So, I thought 3 is out, it’s gotta be a 4, and that was a nice surprise. I would have been happy with that. But, it didn’t stop there. Well, I think you know where this is going. I have a love/hate relationship with the characters. The torment and sacrifice they go through to follow the demands of their race, customs and traditions had me wondering how this could have a happy ending. At one point, my heart fell and I was devastated, but I did recover, in a very surprising fashion. The more I read, the faster I went. A fantastic buildup to an ending that left me screaming for more, but, thankfully, I don’t have to wait for Centaur Legacy, Book II. Laura, my sister, had a spare, signed, first edition paperback of Blood Debt by Nancy Straight and gave me the book. Thanks so very much Laura. Now, I need the rest of the books. This is definitely one series I want to finish.